Rule number one: Stop. Checking. Their. Instagram. You may think you've moved on from your last relationship, but sometimes our behaviors prove otherwise. Dr. Georgia Henderson, a clinical psychologist at Priory's North London Hospital, told us there are six common every day signs someone's still hung up on their ex. You try to make them jealous. "By turning up at places they may be or posting things online," Dr. Henderson explains. You may also be "focusing on their emotional responses to you, rather than what's happening in your life now," she adds. You could be doing this by "asking friends to 'pick sides' or constantly re-analyzing the breakup," Dr. Henderson says. You're focusing too much on "closure." "People may be being really honest when they say 'this just wasn’t right for me' during a breakup," Dr. Henderson says. "There isn’t always someone at fault or a logical reason. Constantly asking your ex to explain what went wrong will just lead to frustration and hurt." 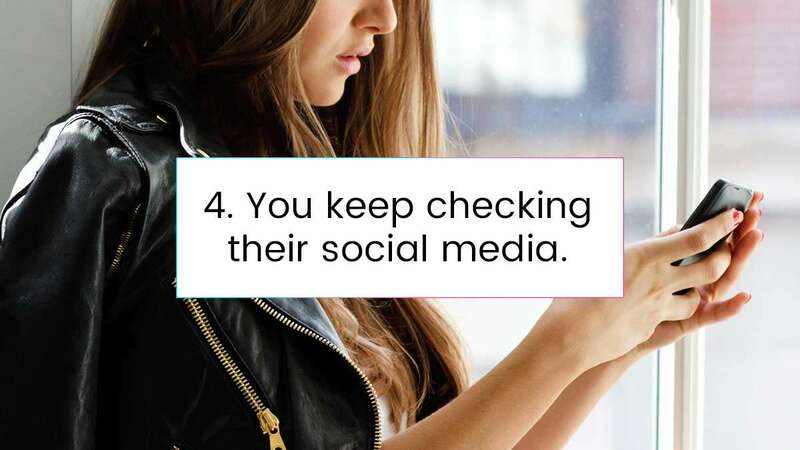 You keep checking their social media. "Following them excessively on social media, such as always checking in on their Instagram posts" is another sign you're not moving on, Dr. Henderson says. "Instead, you should unfriend and unfollow them." Dr. Henderson says, "Having too much to drink and calling them either to talk to them or sometimes to just listen to their voice message, and texting them constantly" are all worrying behaviors. You compare everyone to them. She says to also be aware of the "compare and despair" behavior. "This is when you compare everyone to your ex and find that no one matches up, or you treat a breakup as temporary and suggest you are on a relationship holiday when in truth the relationship is finished," she adds. The first thing you need to do is to validate your emotions, Dr. Henderson explains. "Even if your ex betrayed you, it's ok to be sad as well as angry. You can also be hurt without having to frame them as the 'baddie'." Trying to completely ignore all thoughts about them isn't going to work either, she says. "They were a big part of your life. Losing a partner can mean losing our go-to person. When we try and ignore our thoughts and feelings they actually intensify and become more distressing. For example, if you see a cute meme that they'd love, think of five other people in your life who get your sense of humor and send it to them rather than focusing on not having your ex. Rebuild your network focusing on what the relationship helped you with, and take it as an opportunity to build up the parts of yourself that you may have neglected." Dr. Henderson says one of the best ways to help yourself is to "rewrite your narrative." She explains, "Instead of pining for your shared romantic trip to the Caribbean, remember that spot as the place you learned to surf or when you first embraced a new type of food for example." Most importantly though, she says you want to be with someone "on the same path as you," so, "Try and check in with yourself and ask if you're sad to have lost this person or is it about something else? Lots of us have fears about rejection, abandonment or not being good enough that can be triggered by breakups. If you still haven't moved past the overwhelming feelings in six months, it may be time to go and speak to someone and understand where these feelings have come from so your next relationship can feel exciting and secure again." This article originally appeared on Cosmopolitan.com/uk. Minor edits have been made by the Cosmo.ph editors.